Career Chick Chat: Why are the career tips for chicks "hot"? Why are the career tips for chicks "hot"? 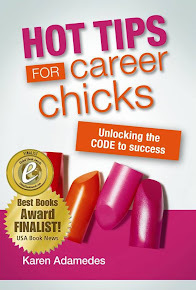 I thought today I'd share with you a bit of the backstory about the title of my book, "Hot Tips For Career Chicks" which is where I draw many of the topics from that are discussed in this blog. Recently, I've been asked a lot about how I came up with the title, so I thought this was something you might be interested in (you can also hear my discussion with Tiffany Crenshaw on Career Moxie Radio where she asked about this - and other topics - or you can download the podcast on iTunes). Originally the book had the working title of 'Hot Tips for Corporate Chicks' - until I had almost finished it and realized that the tips are just as relevant to chicks in all sorts of organizations including government, not-for-profit and small business - because the basics of how organizations work and how to be effective working with others are the same - no matter where you work! I played with other options like Hot Tips for Business Babes and a few other versions but once I got the idea for 'Hot Tips' that was locked in. My philosophy is that you need to understand what is going on in any situation - in this case that women aren't getting ahead in sufficient numbers in their careers nor getting the recognition, satisfaction or enjoyment that they deserve from their jobs - and understand why, but then you need to know what you are going to do about it. Which is where the "Hot Tips" comes into the title. For me, moving forward in your career is not just about understanding the theory of knowing what you need do but knowing how to do it. And then actually putting this information to work. One of the many definitions of the word 'tip' is a 'piece of inside information'. Something that is a sure-thing. Like the name of a horse that will win a race, or a stock where the price is destined to rise. The career ideas are 'hot tips' because they provide insights into how to work and manage a career in one framework that you can use. Rather than learning the hard way - through trial and error. The career tips are an 'insiders' guide to career management and probably a bit more reliable than any tip of which racehorse is going to win the 4 o'clock! I'm a big fan of learning new things. But information is most valuable when you use it. So my vision for the book (and this blog) is that Chicks will learn, practise, use and share the practical ideas to achieve the success and the satisfaction that they want in their careers. I don't have the name of the racehorse that is going to win the 4 o'clock but I like to think that if you follow the tips, you can be first past the post (in your career!). Imagine the race caller, "And it's 'CareerChick' in the lead as they come down the straight, 'The Competition' are chasing her down, but 'CareerChick' has trained hard and is applying all her skills, no-one can stop her now. And it's 'CareerChick' who wins the day! Now that's a career race call that I like to hear!